Get to the beach without leaving Washington this summer. 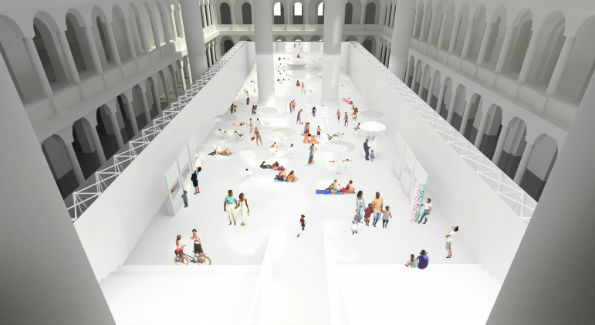 As part of its “Summer Block Party” programming, 10,000 square feet of the National Building Museum will be transformed into an “ocean” of nearly one million recyclable translucent plastic balls. A snack concession inside the beach will be operated through a partnership with Union Kitchen. The installation relied on crowd-funding for much of its cost, and those who donated through Indiegogo get special perks that include getting their names on beach balls and season passes. Opens July 4. www.nbm.org. Admission is first come, first served. 401 F Street NW, 202.272.2448. Celebrate ten years of groundbreaking performances connecting artists and audiences in the District at the Capital Fringe Festival. The festival takes place over 22 days and encourages “conversation, art and community.” There’s something for everyone–theater, dance, music and visual art–and no curatorial barriers to block the artists. Even the venues steer towards the unconventional so don’t be surprised to catch a performance in a dive bar or vacant storefront. July 9 to August 2. Admission prices vary. Visit www.capitalfringe.org for details or stop by Fringe Fest headquarters at 1358 Florida Ave NE. Washington’s tennis team is back with its fourth annual Charity Classic featuring an all-star lineup scheduled to compete for gold to benefit a good cause. Grand Slam champion Laender Paes, American star Sam Querrey, Top 25 doubles player Anastasia Rodionova and Coach Murphy Jensen, who won the 1993 French Open doubles title, are among those competing. July 22, 7 p.m., General admission tickets on sale through Ticketmaster. Purchase premium seats by calling 202-4-TENNIS (484-6647). Kastles Stadium at the Smith Center, www.washingtonkastles.com. Join in Alexandria’s burgeoning music scene at the first-ever Alexandria Live Music Week. Experience ten days of tunes at more than 30 restaurants and venues, including the renowned Birchmere music hall, Murphy’s Grand Irish Pub and Old Town Farmers Market. Don’t miss the kick-off weekend that coincides with the city’s birthday celebration when Alexandria Symphony Orchestra perform as fireworks light up the Potomac River. Kevin Bacon fans, rejoice – The Bacon Brothers will be playing three shows during the week. July 10-19, www.LiveMusicWeek.com, Admission varies by venue, #LiveMusicWeek. Where else would you want to be but the French Embassy on Bastille Day? With the theme “Lafayette returns to America” the Comite Tricolor’s celebration will celebrate “the spirit of freedom the United States and France have shared, and owed to one another, for the last two centuries.” Along with cuisine from some of the area’s best French restaurants, there will be unique entertainment including dancers in period costumes reenacting the 18th century Lafayette Ball. July 10 at the Embassy of France. Costumes or cocktail attire. Tickets range from $90 for early birds to $300 for a benefactor couple, and are partly tax-deductible. Visit bastille-day.org for more information.